A player must be a student of any School and must be studying at 10th, 11th or 12th grade or its equivalent and must have a valid School ID to authenticate the same. 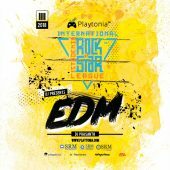 Registered member must keep checking mails, discord channel and updates in Playtonia.com website to see new updates on this tournament. Registered Player must make sure show up on the game day as per schedule and play the game. Registering in this tournament is the undeniable confirmation that you have accepted all the rules and regulations mentioned in this website. SRM Institute of Science and Technology in association with Playtonia eSports brings you an exciting eSports contest where participants compete each other in world renowned game titles such as Counter-Strike:Global Offensive a FPS game for PC players, FIFA 2019 a football simulation game for Playstation players, PUBG Mobile an online multiplayer battle royal game for Mobile players, for exciting cash prize and scholarships and assured admissions at SRMIST, Chennai campus.